It’s holiday time once again, which means it is also the perfect time for a “holiday reality check.” If you haven’t seen your elderly loved ones in a while, now is a good time to examine how your senior loved ones are doing and take the necessary steps in keeping seniors safe. With frenzied lifestyles or long distances separating families for a lot of the year, subtle (or not-so-subtle) indicators can very easily be overlooked. Keep a lookout for the following indications that additional care could be required, and bear in mind that looking for warning signs is not for the purposes of judgment or critique; it’s a check for wellness, well-being and safety. Physical appearance: An unusually disheveled appearance of a senior loved one may be discovered during a holiday visit. Failing to stay up with daily hygiene routines such as bathing, brushing teeth and other basic grooming may indicate health concerns such as dementia, depression, or physical impairments. Check to see if clothes are clean and if the individual appears to be keeping up with good grooming habits. Weight loss: At the dinner table, the senior’s appetite may appear to be healthy during the holidays, but obvious weight loss without trying could be a sign that something’s wrong. For the elderly, weight loss might be related to many factors, such as difficulty cooking or loss of taste or smell. In addition, weight loss is sometimes a sign of a more serious underlying condition, such as malnutrition, dementia, depression, or even cancer. Within the home: Any large adjustments in the way things are done around the house could give clues to the senior’s health. For example, burned pots could mean forgetting about food cooking on the stove. Unattended housekeeping might be a signal of depression, dementia, or other problems. Ensure the lights are functioning, the heat is turned on, the bathrooms are clean, and no clutter is blocking the walkways of the residence. If you see signs like an unkempt home, unexplained weight loss, or overall personality changes, talk to the senior about the possibility of introducing companion care services. Even though it may possibly seem easier to put off challenging discussions until after the holidays, it’s better not to wait until a real emergency occurs. Be realistic with your expectations, and realize that your senior loved one may protest the conversation initially. For now, try to just open the lines of communication. 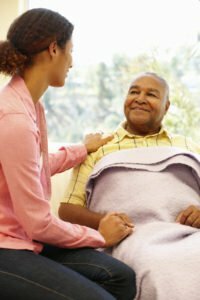 Need help with starting the home care conversation with a loved one this holiday season? Call for more information on the professional elder care in Marin and surrounding areas at (866) 940-4343, where our mission is keeping seniors safe and thriving throughout Marin, Sonoma, Napa, and Solano counties and the Tri-Valley.